Out of Unique gift ideas? 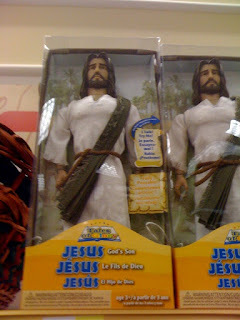 Look no further... just head down to your local Bi-Lo* and buy a talking Jesus doll. Jesus dolls are the reason for the season, after all. Is this the craziest thing you've ever seen???? Ridiculous. *If you don't have a local Bi-Lo, you can find one online here too! Shame on BiLow and whoever made these. I laughed out loud! At bilo no less! Ha!